Producing Your Income-Producing Teleseminars and Webinars – Finally! If you’re like most managers or executives, you are struggling with fewer people to do more work. Your people are smart and good workers, and you know they have to grow their skills to not just keep their heads above water, but instead, create the solutions which will be the foundation for your organization 3-5 years from now. Yet they don’t have the time to go to lunch, let alone attend an involved training session. Better meet your current and future business goals. Improve your key talent’s skills for today and prepare for thechallenges of tomorrow. Create strategies and utilize tools to be more productive. Identify and develop skills that are critical for individual and organizational success. Enhance relationships inside and outside the organization with colleagues, customers, vendors and other business partners. As one of America’s most respected and internationally sought-after key-talent development experts, performance strategists, facilitators and presenters, Rebecca brings her experience as a savvy businesswoman and bestselling author to work on your challenges. Visit our new “Video Clips” section with brief clips from recent presentations. Rebecca got the attendees involved at the Asia CEO Forum Women’s Empowerment Forum in,Manila. Delivering a highly customized talk to a capacity crowd of 300 international attendees in Paris at a users group for a large multi-national company. Rebecca got them involved and they loved it! Some said her session made their trip worth the time and expense. Her two sessions were so popular, enough people couldn’t get in that they asked her to add a third session. Rebecca spoke at a special Bangkok Rotary event on “Authentic Leadership” This was a fund raiser for Together We Can Change the World, a non-profit serving disadvantaged SE Asian women and children. Presenting at the premier Turkish HR conference in Istanbul — one of only two Americans asked to speak. The program was “The Power of Our Words.” Five-hundred HR professionals crammed the room; the program was simultaneously translated into Turkish for those with rudimentary English. 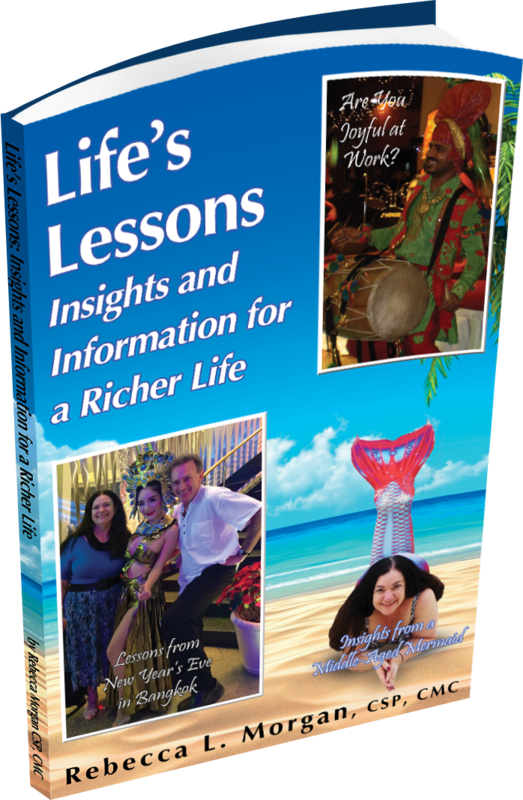 Sign up now for our free VIP list and receive your gift of the eBook and Rebecca's free bi-monthly ezine. Read our most recent ezine full of up-to-the minute news and information you can use immediately. "As a lifelong educator, I can appreciate great teaching, and you are a superb instructor. We all learned a deal from the management seminar, and it proved to be a wonderful team-building exercise as well. "Thank you for sharing your knowledge and experience in such a creative and enjoyable way." "I wanted to thank you for a FANTASTIC two days! I am extremely pleased with how it turned out and I am especially pleased that we had so much participation from the group. I think your ability to read the group as to the style they were most comfortable was spot on. Even [the CEO] came to me and said that he enjoyed the session and learned from it. "I attended an Executive Committee meeting this morning and [the CEO], along with the rest of the EC, stated how thrilled they were with the training and how impactful they thought it was for the managers! A number of them said that they learned quite a few new things. Thank you thank you thank you! Coming from this group is quite a feat! "I’m thrilled by the results and you made a great impact on our managers. I’m looking forward to our continued partnership. If you ever need a reference, feel free to give them my name! Thank you." "The feedback from your session was extremely positive. Thank you not only for sharing your expertise with our participants, but in being willing to coordinate the program to fit our situations. We know that this took extra care and skill. All responses were enthusiastic about the content and the overall quality of the talk, and we had great feedback on your presentation. "We hope to have the opportunity to welcome you back again soon for another wonderful session." "I want to send you words of gratitude for all your efforts before and during the Airbnb [conference]. It was a wonderful feeling to see you in person in Paris, and to watch you present to attendees from around the world. Thank you for the time and ingenuity you dedicated to planning and delivering your presentation. It was a great pleasure to see your enthusiasm, intelligence, and willingness to share knowledge. We can’t say thank you enough for your hard work, your flexibility and your poise." "Feedback from participants has been overwhelmingly positive! Interestingly, the few people who didn’t feel they needed to attend the training as they felt they had already mastered time management were amazed at how much they got out of this training so there’s always room for improvement!" "Thank you Rebecca and once again I really enjoyed your session"
"Yesterdays seminar was most worthwhile and enjoyable." Watch my webinar, "Effectively Growing Your Key Talent: Are You Sunlight and Water — or Just Manure?"